Most people get quite overwhelmed by the prospect of moving. It is always said that its one of the most stressful points of your life along with divorce, having children and getting married, but if you get yourself organised, and utilise the help that’s out there, then it can be quite painless really! 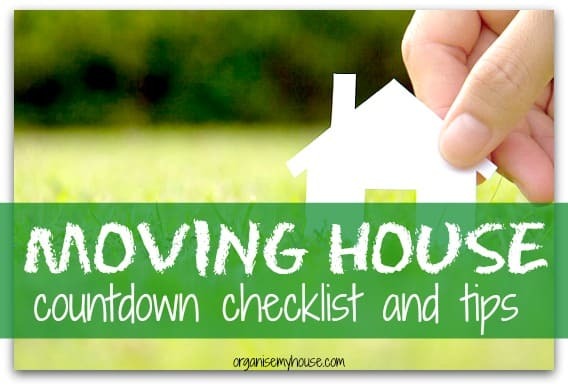 I have tried to give an easy to follow checklist that takes you through the countdown to moving, with lots of tips and tricks thrown in. Let me know if you have any extra tips and tricks, and I hope that if you are moving that you have a stress free time! Moving comes in stages, from the initial decision to move, right through to sitting in your new home the night you have moved in. Its a long road, but so worth it, and following the steps and advice below will really help to keep you on track. Are you absolutely sure you need to move house? If its for more space would your money actually be better spent on extending your current property? The cost of moving is considerable and actually can be seen as a waste of money – extending will mean that you could get the property that works for you without wasting your money at all. Can you reinvent your current home? Can you use your existing rooms in a different way to make more of them? Even simple changes and redecoration can breath new life in a home that you thought you were tired of. I am an interior designer and home stager by trade, and have often had the situation where I have staged a home ready for selling, only for the seller to decide that they love the changes so much they wanted to stay! Seriously think about why you are moving before you start the journey. Try and get your property on the market or ideally sold prior to looking for your next property – its a difficult scenario to be in, but if you are in this position you are ready to be able to pounce on the property of your dreams when you see it, and the sellers may well look at you most favourably in a bidding war if you have your property sold already. You may decide to sell without an agent, which can be a good idea if you are looking to save a bit of money as you save the agents fees, but you also don’t get as much marketing as an agent can provide, or access to a list of people in your area who are actively looking. To get your property sold as soon as possible, ideally you will want to have it staged for selling by a professional. I am a little biased about this step as I am actually a home stager and interior designer by trade – and I really firmly believe in what staging can do for selling a property faster and for its maximum price. Staging does not have to cost a lot, but may mean the difference between selling quickly, and the property languishing on the market for weeks/months. This practise in common place in the US, where most homeowners would not consider putting their home on the market without it being staged first – why would you want to try and sell the most expensive asset you own when its not looking the absolute best it can look? Simple tricks and quick fixes can really make a difference to how viewers will perceive your home – you are trying to create the feeling that you had when you moved into your home – not the feeling that you may have now as you want to move and the home no longer fits your needs. You need to get back to the excitement you had when you first moved in. Personally I have moved twice over the past ten years, and both houses have sold for more than the ceiling price of the road, at the asking price, and to the first buyer that has walked through the door (the second one went to sealed bids too!). This is absolute testament that staging works, and really does take the hassle out of selling. We were ready to make a move on the house that we wanted as soon as we put ours on the market, we were in a strong position and therefore negotiated a great price for that house, and we didn’t have to have the stress of having people walking through the property for weeks or months prior to getting an offer. We didn’t even have the hassle of bartering over the selling price as people simply wanted to ensure they were the ones who got it. Quick, simple and stress free – a great way to start the moving house journey I am sure you will agree! Ensure you know what your wishlist for a new property is. Ask yourself – Why are you moving? Do you need more space, do you want to be local to a good school, do you have family or work that you want to be closer to. If you can write down everything you want in a new home, and prioritise it, then you will be able to see which homes you want to look at and possibly cut down on your search. It will also help you to focus on your move and what you want to get out of it. If you are moving to a new area, research the area and surrounding areas carefully. See how far you would comfortably commute and draw a circle around that area on a map. Then look at whats a high priority for you – schools, being close to shops, being rural/urban etc…. and then you can close your search location down even more – saving valuable time when viewing properties. MOVING HOUSE TIPS – When viewing properties, pick one thats not what you want at all – if you see it and it is a definite NO then you can be more sure your wishlist is right – whereas you may be shocked to discover that this may actually be the one for you after all! – Don’t completely narrow what you are looking for, as you may be surprised! Get on all the local estate agents books – you want to be the first to find out about suitable properties. Show that you are keen and willing to move, and not a time waster. Create a moving folder – and keep everything relating to the move in this – it will then be easy to find all documentation, letters etc…. that can really build up during this time. If you are transferring schools, nurseries, offices etc… then ensure that the new ones have been informed and are ready to take you and your children. Start to create a floor plan of the new property and work out what you want to put where – this will possibly change in the next few weeks, but having it written down will again force you to think about it, and will make life a lot easier when telling removals people whats going on. With things like Sky / Virgin TV and Broadband, call and arrange for them to switch to your new address on moving day – they will then install it at your new property and you will have no break in your service – especially necessary if you work from home. Now is a good time to research who the cheapest and best suppliers are in your new area for gas, electricity etc…. so that you can inform them of your move and start an account if it is a different company to the one you are currently using. Create a list of everyone that you pay any bills to, and update or write beside it if you are going to change supplier once you move. Having everything in one place will make things much easier! Book pets to be looked after by friends, or put in kennels or a cattery for moving day to make life easier! Also do similar with children, as they will find the move easier if they don’t have to deal with the actual move and the stress around them. Let friends and family know about your move – send cards out the week prior to moving as you will be far busier once you have moved. Start to finish off the food in your freezer so that its easy to clean and you don’t waste things unecessarily. Transport all paperwork / documents / precious items with you when you move – this will help with your calmness as you won’t lose it! After the removals have finished in each room, hoover and clean the property – there is nothing worse for the new owners than having to clean the house as soon as they arrive. It is also a lovely touch to leave a bottle of wine and a note welcoming them to the area and hoping that they will enjoy their new home. Ideally for security get a locksmith to change the locks of your new property as then you will be sure that only you have access. Don’t even think about cooking on your first night – get a takeout and a bottle of wine and just chill in your new home – toast a successful move – tomorrow you can start to really sort everything out. Introduce yourself to your new neighbours – you never know when you may need help, or whether they will become friends! I find that if your new home needs decorating it is always a good idea to paint it all in an off white or cream initially – then you can live in the space for a while, see how you live, see what the light is like etc… and then you can make proper decorating decisions over the years. This will ensure you don’t make expensive mistakes and that you get the home of your dreams that really works for you. Give spare keys to a friend or neighbour in case of an emergency – do it now so that you never get caught out! When moving house you need to get organised – you need to understand why you are moving, what you want from your new home, and then find your ideal next property. Once this has been found, then its paramount to organise each step of your move – don’t leave things to chance, and your move should go smoothly. Follow the above moving house tips and make the move stress free – or as stress free as possible for you and your family. Do you have a moving tip to share? Please leave a comment below – thanks in advance! Previous Post: « How to A.D.O.R.E your Utility! I’m about 5 weeks away from my move, so I better get started on that list. I’ve started packing away the less used things. If I can get most of it packed two weeks before the move I would be ecstatic. My kids are going to wait until the last minute to pack, as they always do. I think I’m going to have a box a day rule in place for them in a few weeks. When do you suggest looking for a moving company? I’m thinking about three weeks would be good. Thanks for the comments Ashley – Good luck with your move! I would suggest booking a good removals company as soon as you can as they often get booked up – so even 5-6 weeks if you can. Better to be prepared! Great article, although I would generally let my friends and family know more than 2 weeks in advance, maybe somewhere around the time I find out I’m moving as moving houses is a big thing for me! Hi Pete – good point, thanks for your comment! Your article is so much help. It is precise and informative. I appreciate the effort and time you have spent for this. My brother is moving out in a couple of months for college. I will let him read this. I was almost 20 weeks pregnant when I have moved….it was hectic and very stressful. I am about to move to a new home and the advises in this article will be very useful for the task that I have at hand. Glad it helped Rashid! – you may also want to check out my new site http://www.stagemyhouse.co.uk as there is some useful help on staging your home for sale to get the best possible price for it. Hope that helps too! Moving out and moving in can actually be a lot easier if we know some smart tips from the experts. I always check out self storage companies for more smart and effective house moving tips. Thanks for sharing an information regarding what to do, when to do and how to do in the relocation process. Proper planning is an essential part of the moving process. Just to let everyone know – its now even easier to comment on the blog posts – I have integrated with facebook – let me know what you think, and which commenting you prefer – I want to make this as easy as possible for everyone! Great point – “Can you reinvent your current home”. A lot of people are quick to jump ship and move home because they feel there current home cannot accommodate there new requirements. However a few small changes can go a long way and instead of forking out £££ to move house as well as the added stress and excess baggage that comes with it people could just reinvent their old existing homes. Thanks Zoe – its so true that people can change what they have to be much better for them – and save the money of moving in the process – I have staged homes before for selling only to find that the owner loved it so much they wanted to stay! Thanks for sharing an information regarding what to do, when to do and how to do in the relocation process. Moving with proper plan not only save you from stress but also helps you not to forgot any of your belongings in the previous home. Hello Nick – thanks for your comments – glad that you think planning your move is important! Thanks for the advice – nice to have somewhere that has made me think abuot all aspects of the move process and that has a countdown – was stressing but not anymore!